A 25-year-old Kenyan woman has come forward with allegations that she was kept as a domestic slave for three months by Saudi Arabian diplomats living in Northern Virginia. The allegations come to light two weeks after News4 first reported an investigation into possible human trafficking at a Saudi-owned compound in McLean, Va. The Kenyan woman -- who goes by the name Sheila -- said she was brought to the U.S. from Kenya by way of Saudi Arabia last summer, by people who forced her to work long hours each day, seven days a week, as a domestic worker. "I used to work from 6 in the morning to 8, 10 in the evening," Sheila said by cell phone to News4's Jackie Bensen. "From Monday to Monday." Did you ever have a day off? Bensen asked. "No," Sheila replied. Sheila said she was rescued with the help of a Fairfax County man, Marikio, whom she met on a Facebook community for Kenyans living in the D.C. area. He and Sheila had corresponded online for a couple of days when he grew puzzled by her reluctance to answer basic questions about where she lived and worked. "It's very simple: 'Where you living? You should tell me where you're living.' She was hiding," he said. She told him she lived in a high-rise in a place she knew as Falls Church, but she was not sure of the address because she was never allowed outside. He told her to look at a piece of her boss' mail to see what the address was. Marikio arranged to help her. The rescue ended up being a harrowing one -- particularly, Marikio said, because he knew if he called 911, he risked a chance that Sheila's boss could convince police to arrest him instead, because he was in the country illegally. Still, Sheila -- wearing a head scarf and a veil -- ran from of the lobby of Skyline Towers on Seminary Road and jumped into his car. It was the first time the two had met. Marikio said Sheila was gaunt and in obvious pain. She told him she was hemorraghing from an untreated medical condition. He told her to go back inside and get her passport, and he'd take her to a hospital. "She was sick, and she was shaking, and the police asked her, 'Do you want an ambulance?'" Marikio recalled. "She said yes and the ambulance came." But, Marikio said, when she went back for her passport, she was held by the family she worked for. "She went back, the guy was holding her. He was still holding hostage. She was screaming with her cell phone. ... I say, 'Go out!'" Said Sheila, "I was afraid, because maybe they could have killed me. Because they have taken all my documents. They have taken my passport." Police officers ordered the boss to return the passport, and he did. Sheila then received medical treatment. Sheila now has an attorney, immigration attorney Regina Njogu. An investigation revealed the Saudi diplomat who brought her to the U.S. used an domestic worker visa known as an A3 visa. "I called the embassy, and I spoke with him," Njogu said. "At first he didn't know what I was calling about. When I told him what I was calling about, he said he doesn't care, because he's a diplomat nothing will happen to him." The Saudi Arabian embassy did not return News4's calls for comment. Njogu said her efforts to get authorities to investigate further have been frustrating. "Basically it was a game of ping-pong. I was being referred from one place to another. I could tell from those I was speaking to that there was a great reluctance to get involved." 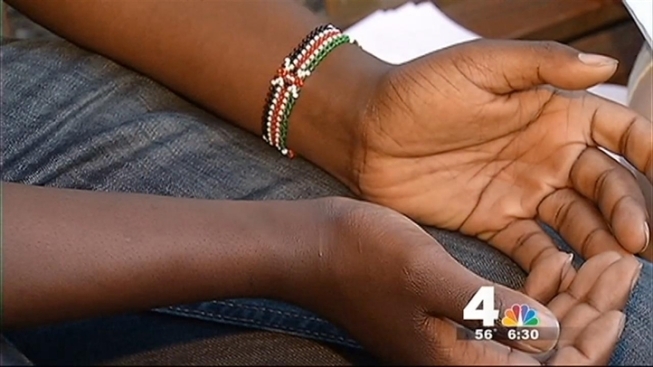 Now, Sheila remains in the U.S., relying on the assistance of fellow Kenyans. Her visa has expired, so she has no way to work. But, she said, she is grateful she can sleep in a bed instead of the floor, where she slept in the Falls Church home.